The perfect bite-sized way to end a meal. 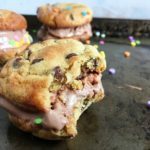 These Ice Cream Cookie Sandwich Bites are small, but delicious! Preheat the oven to 350’F and line 2 large sheet pans with parchment paper. In a medium bowl combine the flours, baking soda and salt. To the bowl of a stand mixer, add the softened butter. Mix for about 1 minute on medium speed. Scrape down the sides of the bowl and add the sugars. Mix for another 2 minutes on high speed, until the mixture is light and fluffy. Add the egg and vanilla extract and mix just until combined, about 30 seconds or so. Scrape down the bowl. Reduce the mixer speed to low and add the flour, mix until combined. Scrape down the bowl and stir in the chocolate chips. Roll 1/2 ounce portions (about a tablespoon) of cookie dough into balls. Place them on the baking sheets and bake until lightly browned, about 8-11 minutes. Remove from the pans and cool on a rack. When cookies are cool, make the sandwiches. Lay out half of the cookies on a sheet pan and top each with about 1 tablespoon ice cream. Top with the remaining cookies. Add sprinkles or other goodies to the sides and enjoy immediately. Feel free to swap out the ice cream for another frozen treat – soy milk ice cream, coconut milk ice cream and even frozen yogurt will work here! You can freeze these too! Make as above, then wrap individually in plastic wrap and freeze.